Invisalign Teen is ideal for teenagers that are suitable for Invisalign treatment. Normally the teenage years are when most orthodontic treatment is performed. While most teens have the standard braces and wires, more and more teens are having treatment with the Invisalign system, With Invisalign Teen, you can straighten your teeth without metal wires and brackets getting in the way. You're free to enjoy the things that make these the best times of your life. Invisalign Teen is similar to the regular Invisalign system. The plastic aligners fit over your upper and lower teeth and gradually move your teeth into the ideal position. The aligners are custom made to fit your teeth and allowances are made for any growth and development of the teeth and jaws so you can be confident that you'll get the desired outcome. Invisalign Teen aligners need to be worn for 20-22 hours each day for the ideal result. One of the benefits of Invisalign Teen is that they have a blue indicator that will gradually change to clear as the aligners are worn so you can see if your teen is wearing them for as long as they need to. Just like regular Invisalign, you will change to a new set of aligners every 2-3 weeks and their treatment will include 6 spare sets just in case they need replacing. 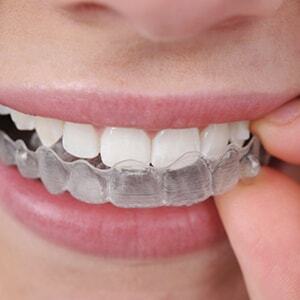 Virtually invisible: The aligners are virtually invisible which makes it ideal for teens. This means you won't need to feel self-conscious about having treatment because no-one will be able to tell. Low impact: One of the biggest benefits of Invisalign Teen is the aligners can be removed for playing sports, eating, drinking and for photos. Aligners are removed at meal times so you don't have to avoid any hard or sticky foods as you would if you had braces. Good for oral health: Invisalign aligners are removable which ensures your teen can keep up their normal tooth brushing and flossing routine without the worry of cleaning around braces.